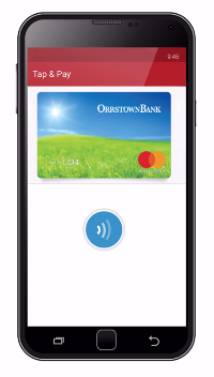 Use your phone or laptop to quickly and securely pay with your Orrstown Bank Debit card. Apple Pay® is a mobile payment and digital wallet service by Apple Inc. that lets users make payments using an iPhone®, Apple Watch®, iPad® or Mac®. Apple Pay does not require Apple Pay specific contactless payment terminals, and can work with existing contactless terminals. 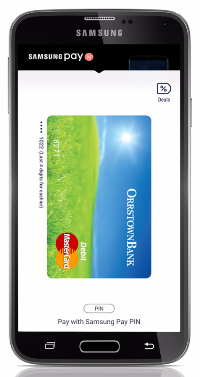 Load an Orrstown Debit Card and pay right from your Apple® device. Google Pay™ is a digital wallet platform developed by Google to power in-app and tap-to-pay purchases on mobile devices, enabling users to make payments with Android phones, tablets, or watches. Google Pay uses near field communication (NFC) to transmit card information facilitating funds transfer to the retailer. Just sign up with your Orrstown Debit Card, and add your favorite loyalty and gift cards too, and you're ready to pay in a whole new way. Samsung Pay® is a mobile payment and digital wallet service by Samsung Electronics that lets users make payments using compatible phones and other Samsung-produced devices. Just sign up with your Orrstown Debit Card and you're ready to tap & pay instantly. Masterpass™ is a digital wallet that simplifies the checkout process with one secure account. Unlike other digital payment products, Masterpass works across channels - online, in apps and in stores - on any device - desktop, tablet, and mobile. How do I add my Orrstown Bank Debit Card to Apple Pay? Go to Apple Wallet and tap Add Credit or Debit Card. Tap Next. 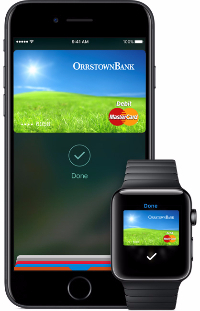 At this point, Orrstown Bank will verify your information and decide if you can add your card to Apple Pay. After we verify your card, tap Next. Then you can begin using Apple Pay. 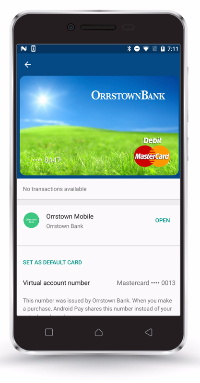 How do I add my Orrstown Bank Debit Card to Google Pay? You can add one or multiple cards to Google Pay. Open the GooglePay app.If you have multiple Google Accounts in Google Pay: At the top left of the app, touch your name, then choose the account you want to add a card to. At the bottom right, tap +. Tap Add a credit or debit card. Use the camera to capture your card info or enter it yourself. If you’re asked to verify your card, choose a verification method from the list. Note: After you add a card, you might see a small temporary charge on your account. It won’t affect your balance and will disappear soon after. How do I add my Orrstown Bank Debit Card to Samsung Pay? Navigate to and touch ADD > Add a credit card or debit card. Align your payment card inside the frame. Samsung Pay will automatically detect the card number and expiration date. Enter any remaining required information. Then, touch NEXT. To authenticate your identity, touch the desired verification method. Enter your signature. Then, touch SAVE. To complete the process, touch DONE. How do I add my Orrstown Bank Debit Card to Masterpass? Step 2: Create an account and login. Step 3: Add your eligible Orrstown Debit Card. Once you confirm your payment and shipping information, you're all set! Android, Google Pay, and the Google Logo are trademarks of Google Inc.